Recently we have taking on the project of baking something we Dutch call ‘Limburgse vlaai’ (pie or flan from the province of Limburg in the south of Holland). It is very popular all over the country and there are even stores that sell nothing but ‘vlaai’. The best known and loved versions are apple crumble, apricot, creamy rice and (of course) cherry or as we call it ‘kersenvlaai’. One of the best things about this pie for a bread baker is the dough, because it is really only an enriched bread dough. So it looks and feels familiar. And for most people it is hard to get their hands on fresh vlaai. So baking your own vlaai is the logical thing to do. We set ourselves the task of baking great tasting vlaai. And we do have to say taste-wise this pie is already close to perfect. The lattice work can do with some improvement but in the meantime we are eating delicious pie. Or bread and jam as Ed likes to call it. That maybe also explains sharing a pie between two people that was intended for 10! First prepare the cherry filling. Combine the thickening agent with the sugar. This way you will not get any lumps when you add it to the cherries and liquid. Put the content of the cherry jar in a saucepan and add the vanilla and lemon juice. Now add the thickening agent / sugar mixture. Give the mixture a good stir so all the sugar and thickening agent dissolves. The cherry mixture will turn cloudy at this point. Slowly bring to a boil while stirring and watch as the liquid becomes clear. When you reach this boiling stage, gently boil it for 1 minute further. You need to get the right consistency. We would describe it as viscous or maybe something similar to the mucus of an angry dragon. 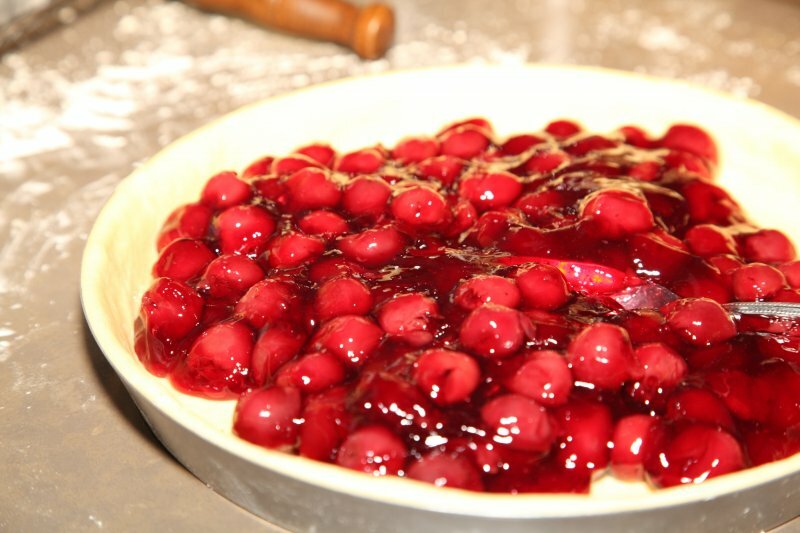 When warm it is like thin jam, when it cools it becomes thicker. Leave to cool while you prepare the pie dough. If you want to make absolutely sure there are no stones left in the cherries you can roughly chop them first. For the dough you first dissolve the yeast in the lukewarm milk. If you use instant yeast you can add that directly to the flour. Add the salt and sugar to the flour and combine. Now add the milk and egg and bring it together. When it starts forming a ball you can add the soft butter. Knead for 5 minutes with a standing mixer or for 8 to 10 by hand. Put the dough in a greased bowl, cover and let it rest for 1 hour in a warm place (24ºC / 75ºF to 27ºC / 80ºF would be ideal). Preheat your oven at 220ºC / 430ºF conventional setting. 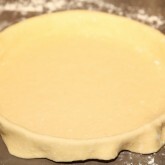 Prepare a 28 x 3 cm / 11 x 1.2 inch vlaai mold or similar tart pan by greasing it with butter or spraying it with some oil. Take the dough out of the bowl and roll it into a nice circle, about 3 mm / 0.12 inch thick. 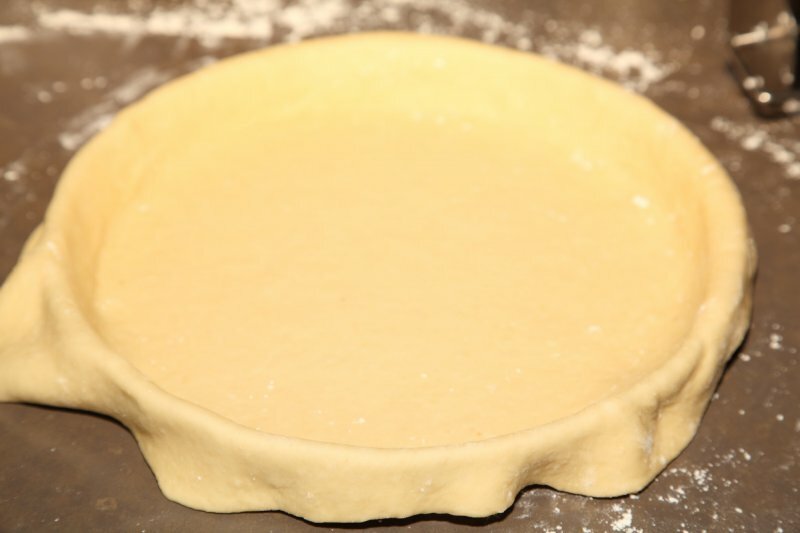 Leave the excess dough hanging over the edges, but make sure the dough inside the mold is neatly fitted. Puncture the dough with a dough docker or fork. Cover and let the dough relax for 10 minutes. 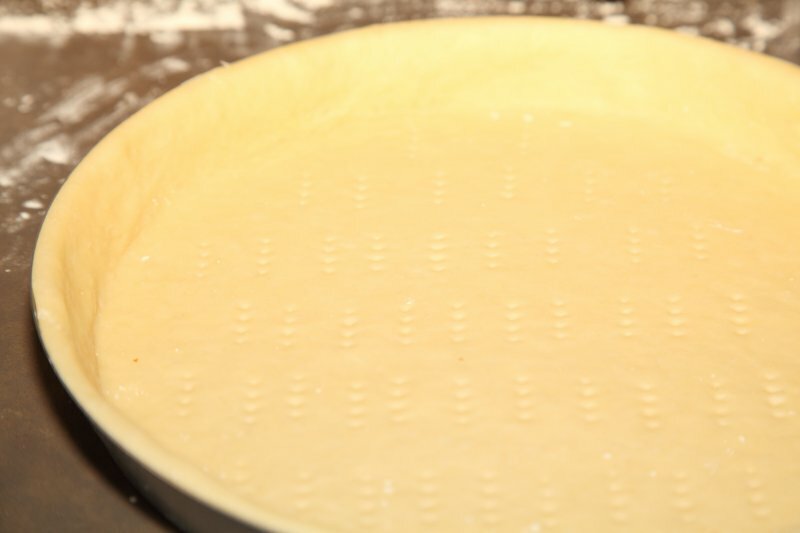 Now with a rolling pin, trim off the edges / excess dough by carefully pressing it along the rim of the mold. 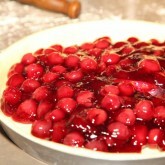 Add the cherry pie filling and distribute evenly. 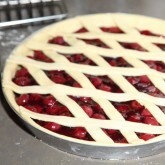 Make a lattice with the leftover dough and cover the pie. Sprinkle the lattice with some course sugar. Bake in the preheated oven for 22 to 25 minutes. If the browning goes too quickly you can temper the oven a bit after about 15 minutes of baking time. Leave to cool in the mold for 30 minutes and then carefully lift it out with the help of a palette knife or pie lifter for example. Now leave to cool completely on a cooling rack. Also very good with a dollop of whipped cream! I am making vlaai for the first time! Cherry vlaai! 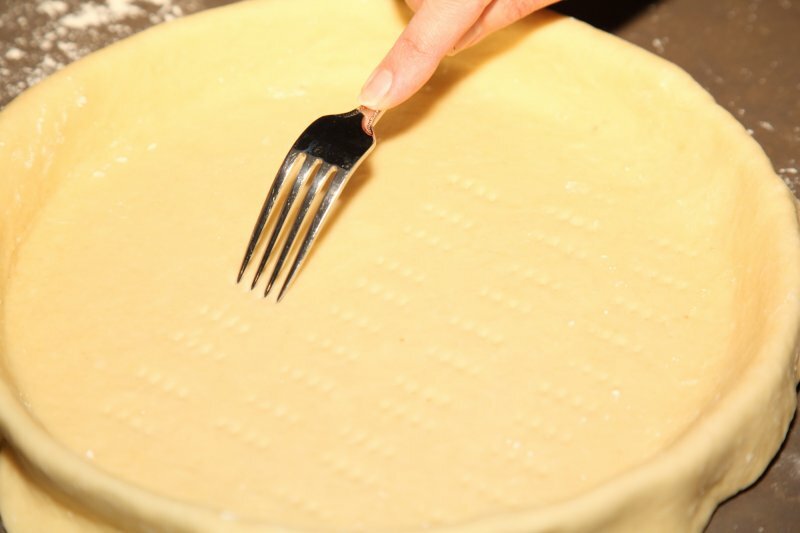 On the pictures I see that you puncture the dough with a fork before putting the filling in. The recipe does not include that step. I assume that I need to puncture the dough in the pan before I give it a ten-minute rest. Would you please add that step to the recipe? Thank you. I love your site. P.S. When I am in Limburg I eat gooseberry vlaai, my favorite, but I can’t get the gooseberries here. Yes exactly before the ten minutes rest. Thank you for noticing, I already updated the recipe. And thank you for your kind words. Great to read it was a success Ineke! And a good suggestion too, to make some buns with leftover dough. Custard flour is the thicking agent I (and my mum) use. Cheers. Kan ik ook verse kersen gebruiken, of is dat niet aan te raden? Hallo Alisa. Dat moet zeker wel kunnen, echter je moet nog wel op 1 of andere manier sap hebben om te binden. Hiervoor kun je ook een fles kersensap gebruiken, samen met de kersen en wat suiker eventjes koken en dan binden. Kwestie van uitproberen! In the UK bottled and tinned cherries are available but you don’t have much choice. The cherries I used were sour cherries in syrup from Lidl which come in a 680g jar. I suspect that these may not have been as tightly packed as the cherries you were using as even 20g of arrowroot (my substitute for potato or tapioca starch as both of these are almost impossible to find although you can get the potato and tapioca flour for gluten free baking) I was not able to achieve a sufficient set to prevent the syrup from bubbling over the lattice and sides of the pan. When thickening the syrup, I couldn’t decide whether it looked “wobbly” or like “dragon mucus” lol. A photo of the consistency would probably have been helpful at this point! Either that or measurements of the syrup volume. Otherwise, thanks for the recipe. It’s lovely and a dream to eat, if not to look at on this occasion. Will make again going for a thicker set on the syrup before filling the vlaai. p.s. have just found out that although potato starch and flour are different, tapioca starch and flour are the same so I’ll use that next time. Thank you Niki for your feedback and for mentioning all these things. I checked and I can tell you that our jar of cherries has 350 g cherries and 350 g of juice (so half / half and the total is 700 g). 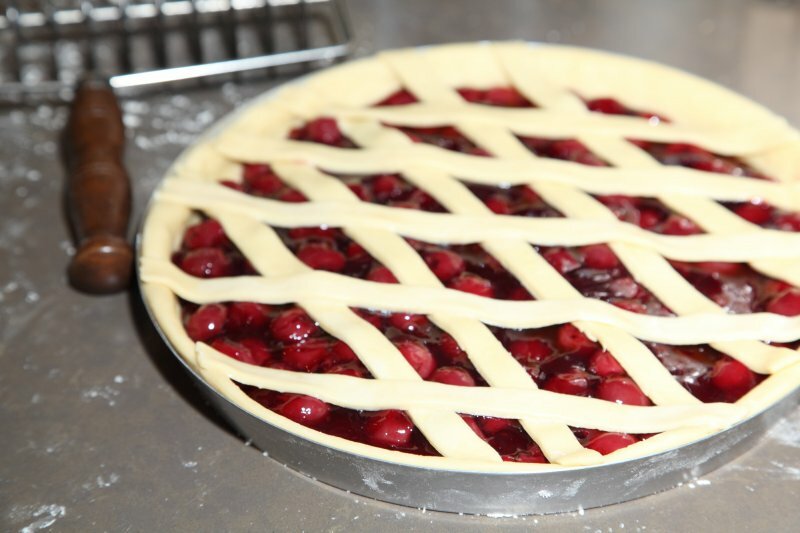 If you enlarge the 4th picture in the gallery I think you can get a good idea of what the state of the filling should be as it goes into the pie dish. It does not run, to get it evenly distributed you need to spread it out. So if the ratio juice / cherries was different you could maybe adapt that next time and I am not sure about the different workings of the arrow root so it would be good to try the tapioca. Thank you very much for trying the recipe and hope next time it will be perfect to both look at and to eat! We are very fortunate in usually getting positive feedback on our recipes. 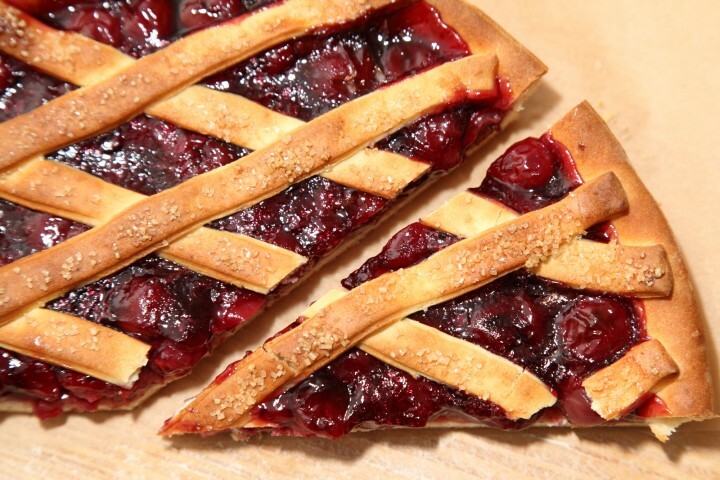 And if somebody likes enriched bread doughs and cherries…then what’s not to love about this particular recipe. But we have to allow for cultural differences and backgrounds. Till now everybody in Holland seems to love the ‘vlaai’ but we all grew up with it of course. Maybe this is a big hit in Holland but in some other countries an acquired taste. Wauw! Een echte verjaardagstaart. Een kleine tip: een bakblik eronder voor de vulling die er mogelijk overheen zou kunnen borrelen. Marieke, je bent geweldig! Geweldig recept. Precies gedaan wat er stond. Het kneden en rijzen laten doen door mijn broodbakmachine. (Dat is ook het enige waar ik hem voor gebruik, kneden en rijzen.) In plaats van een 28 cm ø vorm een 24 cm gebruikt. Hoeveelheid ingrediënten daar op aangepast, er wel voor gezorgd dat de onderlinge verhoudingen klopten. Het was even een gereken maar het resultaat was fantastisch. Zie voor een foto onder het kopje Your Loaves. Zojuist gebakken, heerlijk en geweldige smaak. Ik heb als vulling een blikje kersen vlaaivulling van Hak genomen. Dus geen gedoe met inkoken e.d. gewoon makkelijk en echt Hollands! Oh wat leuk, dat kan natuurlijk ook en doet me denken aan ‘vroeger’! Het is verder geen straf om de vulling te maken met kersen en wat bindmiddel. Beetje meditatief in een pannetje staren en roeren en het is alweer klaar. Fijn dat de vlaai zo goed gelukt is. Krijg meteen zin om er zelf weer een te bakken. Ervaringsdeskundige in het proeven van diverse Limburgse vlaaien, vooral tijdens wielrennen! !